Landscaping not only sets up an atmosphere, it can greatly improve the functionality of your outdoor spaces—not to mention the value of your home. 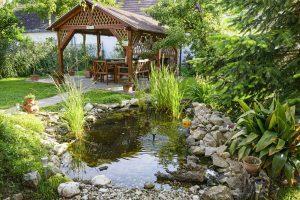 Quality landscaping is about more than just keeping up the grass and plants. It is creating your own private outdoor space, designed just for your needs. 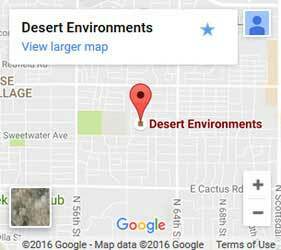 Desert Environments has more than 25 years of experience performing landscaping in Phoenix that is customized to each customers' style, needs, and budget. And we always start with a free estimate so that you know exactly what you'll be getting and for how much. Our team works with you! Tell us what you want. We begin every project by listening to you. Then we take a look at your yard and listen to your land usage and design plans. After you give us your budget, we'll draw up realistic plans to help you visualize the outcome. We keep you at the center of every decision and make sure we have a clear understanding of your desires, as well as your approval before we begin. From water usage and maintenance levels to functionality, our contractors consider everything! We help you decide where the right lighting should go, what spots may do best with a shade structure, what types of plants and trees grow best for what you have in mind, and much more. Our team fully understands the Phoenix climate and how to design and build your landscape project to suit it. When you install an outdoor kitchen or one of our other landscape architecture pieces, you basically have a home addition. You have a uniquely inviting space to gather family, friends, and neighbors. Call now and let us know what you have in mind for your landscaping in Phoenix. We're here to help. From the free estimate to the finished product, feel free to ask us anything!